Before conducting any important liturgical service, an Orthodox Christian deacon needs to be attired in formal vestments. The vestments a deacon wears are ornate and distinguished in keeping with his position in the clergy order. To help Orthodox Christian deacons carry out their divine duties to the best of their abilities, Istok Church Supplies offers a broad range of top quality Deacon vestments (Violet-Silver). Our deacon vestments are available as complete sets that include a sticharion, orarion and cuffs so you don’t have to look for these items individually. 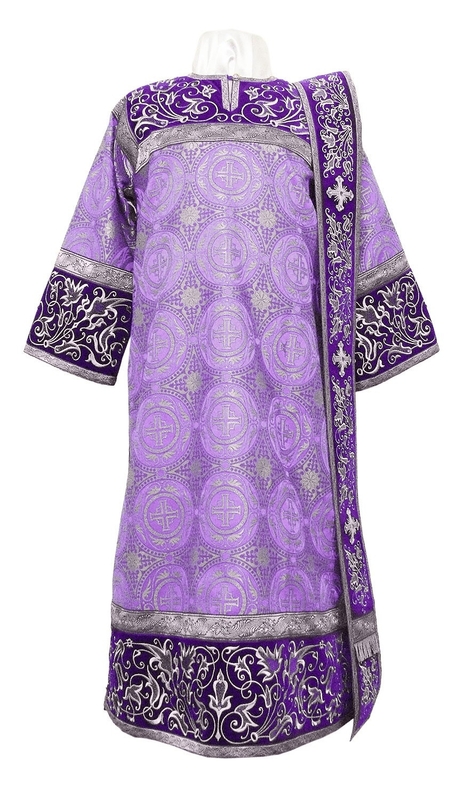 We offer Deacon vestments (Violet-Silver) in a wide variety of beautiful fabrics including rayon brocade, metallic brocade, Chinese rayon brocade, natural German velvet and embroidered fabric. Whether you’re interested in the majestic brilliance of metallic brocade, the simple elegance of natural German velvet or the exquisite beauty of embroidered fabric, there’s something for everyone in our collection – and that too, at pocket-friendly prices! The Deacon vestments (Violet-Silver) we stock are suited for all church seasons but they are most popularly worn to commemorate feasts and days dedicated to Cross of Our Lord. We make sure they are constructed according to the traditions and canons of the Orthodox Christian faith. We provide natural velvet inserts and 100% natural rayon lining for all our Deacon vestments that add value and life to the garment. Decoration brings out the true beauty of a deacon’s vestment and for this we offer two style option – standard and premier. For standard style that’s available at no extra cost, we include good quality galloon and embroidered crosses. For premier style, we provide solid jacquard galloon and lavish, hand-embroidered crosses. We are reputed all over the world for our made-to-measure vestments. The ordering process is simple – you can provide us your precise measurements and customization requests and our tailors in Europe will construct best-fitting vestments. We require a few short weeks for executing orders but we assure that the final product is well worth the wait. Browse through our vast collection of top-quality deacon vestments at unbelievable prices!